Did St. Paul Pray for the Dead? Yes! 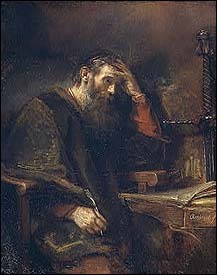 St. Paul wrote 2 Timothy shortly before his martyrdom. He spent the last days of his life in the Mammertine Prison in Rome, north of the Roman Forum. While in that prison he wrote to Timothy and says a prayer for a man dead man. “It seems apparent that St. Paul DOES pray for the dead. Here is my short article that gives a pretty clear example of St. Paul praying for a dead man, a man named Onesiphorus. This will be interesting for those who deny prayer for the dead and must find supposedly find everything explicitly in the Bible before they are willing to believe it. Does the Bible record St. Paul praying for a dead man? Does the New Testament relate an incident of prayer for the dead? It seems quite certain that it does. Let’s begin with Onesiphorus—a faithful Christian who cared for St. Paul while he was in prison and who took great personal risk to serve the apostle. He was such a good man that Paul writes, “[Onesiphorus] often refreshed me; he was not ashamed of my chains” and “he searched for me eagerly and found me” and “you well know all the service he rendered at Ephesus” (2 Tim 1:16-18). But from all indications—certainly from the words Paul uses—Onesiphorus has died or been killed before Paul wrote Second Timothy. Almost all commentators concede that Onesiphorus had probably died—maybe even martyred during Nero’s persecution. Paul speaks of him in the past tense and strangely asks for God’s mercy on his “household” without mentioning him, as though he was no longer here. Because Onesiphorus had served so well and was no longer alive, Paul prays for God’s blessing on his surviving family. All implications are that Onesiphorus has died. But Paul prays for him! In 2 Timothy 1:18, while in prison awaiting his death, Paul prays for the dead man and it is recorded in the Bible. Here is what St. Paul writes, “May the Lord grant him to find mercy from the Lord on that Day.” This is not just an expression of sentimental emotion—this is a prayer for a man who has died, it is prayer for the dead. Paul, who was earlier known as Saul the Pharisee, was well immersed in the teaching and tradition of the Pharisaical Jews. The Jews prayed for the dead and Paul would not have seen the practice as egregious or unbiblical; rather, he would have viewed prayer for the dead as a proper practice for a Jew, and also now for a Christian who believes in the afterlife. To read the article, click Prayer for the Dead: Did St. Paul Do This?